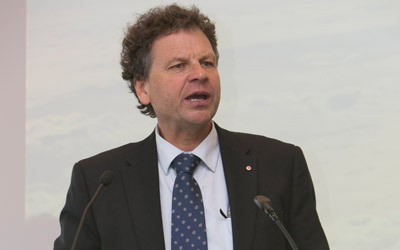 Mr Simon McKeon AO, Chancellor Monash University, hosted the annual Matheson Society lunch on 27 June at the Monash Caulfield Campus. The lunch celebrates and recognises those who have generously decided to leave a gift in their will to the University and our wonderful donors, supporting our students and research programs. This year we featured the Monash Institute of Medical Engineering (MIME). MIME leads translational research and innovation across Monash faculties, partner hospitals and collaborating medical research institutions. 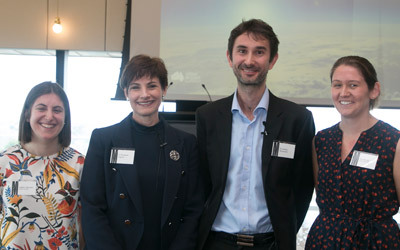 Two leading researchers Dr Elizabeth Sigston, ENT surgeon, and Dr Andrey Molotnikov, Engineer, were joined by Monash students, Erin Brodie, recipient of the Dr Marie-Faith Fiawoo Memorial Scholarship, and Gabby Newman to share their ground-breaking research in 3D printed medical technology. The presenters were able to deliver a fascinating insight as to how 3D printing technology is used to create bespoke bone replacement in cancer patients. 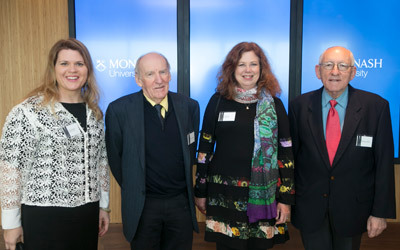 With 3D printers working in the room and examples of different types of materials that can be printed available on each of the tables, the event provided an opportunity for guests to see firsthand how Monash University’s research is having life changing impacts on outcomes for patients. 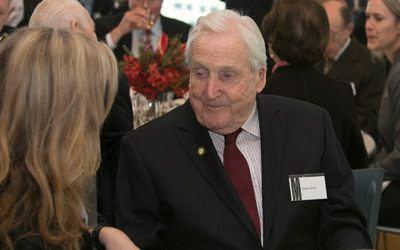 If you would like more information on the Matheson Society, please call 03 9903 4395 giving@monash.edu or visit our bequests page.